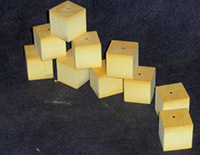 Coretack®: Acoustical applications requiring a tackable surface. Coreboard®: Acoustical wall and ceiling applications. 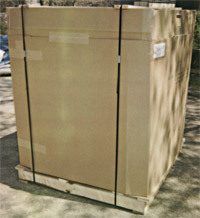 OEM: Custom molded insulation to your specific design requirements. 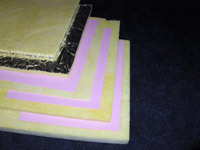 Prestressed Isolation Board: Acoustical applications requiring load-bearing capabilities. Quiet Core Inc., founded in 1981, is a family owned and operated business that specifically fills a need for quality molded fiberglass products. We design and build our own equipment. This enables us to manufacture fiberglass products to closer tolerances than is normal in the industry. Our process insures an odor-free product(low TVOC emmissions) of high quality. Consistent high quality is achieved through the use of Statistical Process control. Board products are shipped on oak pallets, protected top and sides with 125 corrugated sheets; strapped with .020" steel strapping over oak boards. Order Acceptance is subject to Quiet Core Terms and Conditions of Sale. All of our products are made to order. Please contact our sales department for your requirements.